Photo: Paul Wellman/file photo Santa Barbara Sea Shell Association. Before becoming experts at seamanship, generations of sailors have participated in the Santa Barbara Sea Shells Association, a program that could be described as both sea-kidship and sea-kinship. It introduces youths ages 7-16 to the rigors and joys of sailing with the support of their families while making new friends. The inner harbor off West Beach is especially picturesque on Sunday afternoons when the Sea Shells are in action with three classes of small boats â€” US Sabots, RS Teras, and RS Fevas â€” plying the waters. 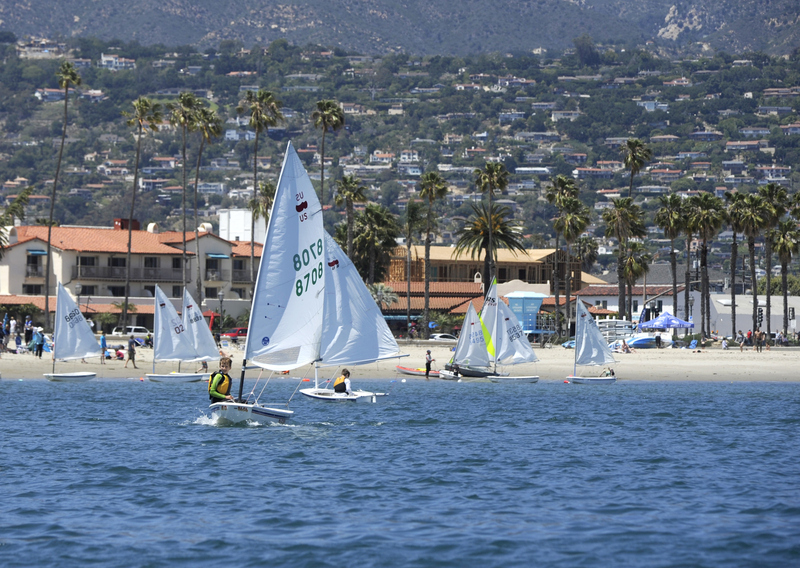 Beginners learn the rudiments of sailing before they begin to race. Photo: Paul Wellman/file photoSanta Barbara Sea Shell Association. And they take care of each other, in a way that was sensational on September 3, 2017. The parents were enjoying one of their occasional opportunities to race the boats while their children were on the beach. A sudden, freakish microburst with 80-mph winds and a torrential downpour hit the coast. The powerful but brief storm capsized all the boats, but the only injury suffered by a Sea Sheller was a parentâ€™s minor bump in the head. â€œEverybody kept their cool,â€ said Lovan. Early on, all sailors learn how to bring their boats back up after flipping. Would-be sailors are welcome to join the Sea Shells at any time. Annual fees for membership and storage are about $250. Boats can be purchased or rented. The 2019 season gets underway with three instructional Sunday sessions (April 7, 14, and 28) at 1 p.m. at West Beach. Everybody will be pitching in to help maintain the storage sheds on April 21. Information: sbssa.org. MARCH MADNESS: One-and-done does not get it done in the NCAA menâ€™s basketball tournament. That was the lesson Sunday after Duke and Kentucky, studded with NBA-ready first-year stars, were ousted by Michigan State and Auburn, two teams top-heavy with seasoned veterans. The winners will join Virginia and Texas Tech, who also lean heavily toward experience, in the Final Four. My bracket (dubbed â€œRedemptionâ€) is busted except for Virginia, which I picked to become national champion a year after the Cavaliersâ€™ ignominious first-round exit. A noteworthy coaching performance was turned in by Cori Close, who took UCLA into the womenâ€™s Sweet 16 for the fourth consecutive year. The Bruins, who started the season 3-5 in a rebuilding mode, went 5-2 in March, losing only to a pair of Final Four teams: Oregon, 88-83 in overtime, and Connecticut, 69-61. It was the second time Close was on the scene when mighty UConn averted a serious upset bid in the Sweet 16. Fifteen years ago, she was associate head coach at UCSB when the Gaucho women fell eight points short in Hartford, 63-55. That was the most spectacular of 10 NCAA playoff appearances that Close made as a player and, later, as top assistant to former Gaucho head coach Mark French. ON TRACK: There is a lot of baseball yet to be played, but UCSB is beginning to resemble the team that made it to the College World Series three years ago. After taking two out of three games at Cal State Fullerton last weekend, the Gauchos achieved the same record (19-5) they had at this stage in 2016. They will entertain Stephen F. Austin from Nacogdoches, Texas, in a three-game series this weekend. STROKING HER FIRE: Pratima Sherpa (featured here March 21), the only amateur golfer competing in the womenâ€™s IOA Championship at the Morongo Golf Club in Beaumont, missed the cut after shooting 79-83 last week. The SBCC student, who will play on the Vaquero womenâ€™s team in the fall, saw what it takes for her to become the first female pro from Nepal.